Good afternoon, Students! Welcome to the first in a series of articles on some of the basics of courteous, and safe, urban bicycle riding. I should probably mention that this is a set of guidelines that KT of Vélo Vogue and I are hashing together and that they are 100% biased and based in our desire to no longer be more frustrated with our fellow riders than we are with the silly drivers who insist on getting behind the wheel with a latté and an Iphone and a lap dog after getting 2 hours of sleep each night for a week. When we realized we were complaining more about bicycle on bicycle interactions lately than we were about vehicular traffic we decided it was time to write something about it. Today's lesson is about my biggest frustration with other riders on the road; passing on the inside. One of the things that those of us who took Driver's Education learned early on, before we were allowed behind the wheel of a car, is that it is illegal and dangerous to pass another vehicle on the right. This applies especially to bicycles in the bike lane. The usual configuration of a bicycle lane in the United States is to the right of the car lane and to the left of the parking lane. 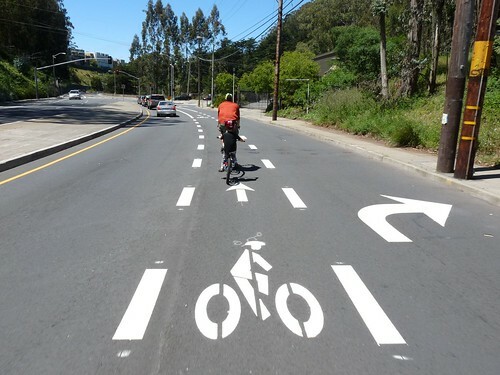 In San Francisco, where there are many one way streets with the bike lane on the left side of the road, this could also mean passing on the left so I will just call it passing on the inside. Most bicycle lanes are not wide enough to ride two abreast. To pass a rider who is ahead of you, you should make sure it is safe to leave the lane and enter the car lane to the left. From there you can accelerate to pass the forward rider and then re-enter the lane ahead. The rider with the green backpack is doing the right thing. He exited the lane, entered traffic when safe and accelerated around the riders in front of him before reentering the lane. It is NEVER acceptable to force your way forward by squeezing between the forward rider and the parked cars! This is a guaranteed way to push someone into traffic. The female rider with the polka dot helmet would be in the wrong if she tried to pass the rider with the black backpack on his right. In this bicycle lane above, just don't pass. Unless you can safely get into the traffic lane yourself, trying to squeeze through in the bicycle lane will push the forward rider into traffic. This is not OK. In the above picture, you see something really common, and really awful, that happens all the time in San Francisco. The guy in the white shirt is riding on the inside of the lane. If he decides to overtake the woman in the brown jacket she will be forced to move to the left into traffic. Especially if she does not know he is there. If she is an inexperienced rider she will most likely overcompensate and swerve quite far into the car lane without looking. Many times I have found myself actually being touched by the shoulder of someone suddenly passing me on the inside! Enough for today. I think you get the picture. cross posted at Change Your Life. Ride A Bike! It might be worth mentioning a corollary: as a cyclist you should try and ride on the right side of the lane when you can safely do so. Obviously you don't want to be traveling in the door zone, but at the same time a cyclist coming up behind you shouldn't have to make a decision about whether it is safer to pass you on the right or left. In an ideal world a cyclist coming up behind you will see your position in the lane and will immediately see that passing on the left is the safer path for both you and them. 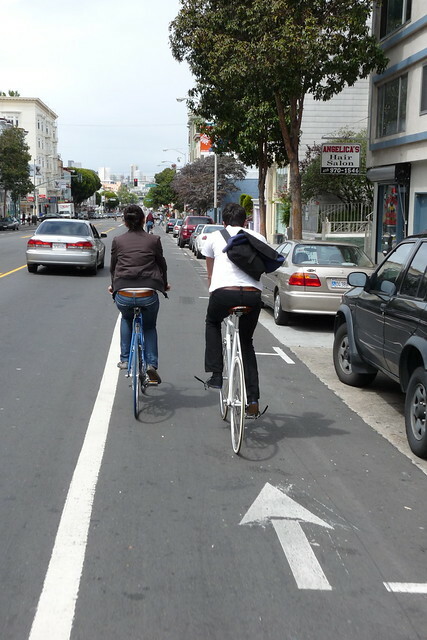 chackoc- with few exceptions, the bicycle lanes of San Francisco are not meant to have two riders abreast in them. With that in mind, there is no safe means of passing another cyclist within the lane. If someone were to pass on the left within the lane it would force the forward cyclist into the door zone and, quite possibly, into a parked car. I have seen that happen, too. If we expect drivers to give us three feet, we can certainly expect ourselves to give one another the same. Trying to imagine having the problem of other bikes in the bike lane, because that would mean we had bike lanes. We do have a few sharrows, and one bike laned artery through the 2d worst neighborhood in the city. So I really don't have the luxury of worrying about which side someone passes me on . . . but it does make me want to get violent when I have to veer into traffic to accommodate a cyclist who is going the wrong way, riding toward me in my lane. They're going out of their way to be jerks.